If this isn't enough to get you into design school then what is? A 15-year-old teenager in Thailand is the designer behind the DB11 renderings you see here. Jennarong Muengtaweepongsa’s DB11 Volare imagines a bold and aggressive future for Aston Martin’s latest model. The front-end sports a massive grille and a splitter and the hood has two fairly large vents carved into both sides. At the rear is where you’ll find a giant diffuser. The sporty design is a departure from the swanky DB9. So far we’ve only seen spy shots of the DB11, which means the Volare concept could be right on the money. 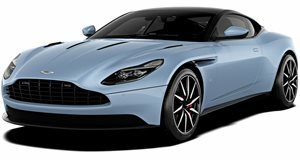 Then again, Aston Martin isn’t likely to sacrifice the luxury look of the DB11 just to add performance parts. If anything, this talented young designer has given the world its first look at a tuned DB11. Kudos, kid. Keep up the good work.